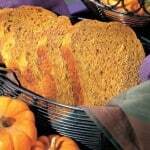 A fall celebration of color, texture and flavor, this bread has toasted pumpkin seeds for crunch. Measure ingredients into baking pan in the order recommended by the manufacturer. Insert pan into the oven chamber.